Innsbruck is a city in Austria. About 120,000 people live there. 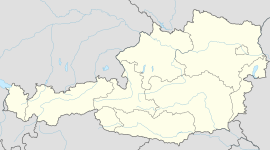 It is the capital of the Austrian federal state of Tyrol and also a district of Tyrol. It is one of the biggest cities of Austria. It has an area of 104.91 km2. The highest area is the Praxmarerkarspitze (2641m). The deepest one is the Inn near Ampass (565m). The name Innsbruck comes from the German words Inn, a river, and brücke, a bridge. It means "bridge over the Inn". This page was last changed on 30 March 2019, at 12:05.